If someone said jump off the harbour bridge, would you do it? Excited and just a little terrified? That old saying 'If someone said jump off the harbour bridge, would you do it?' 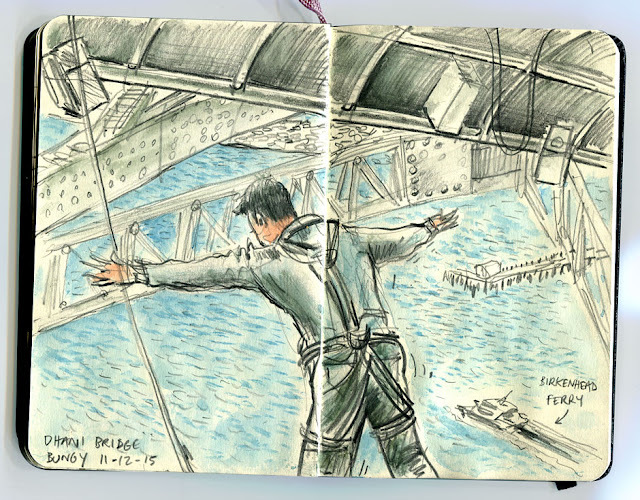 was echoing in my mind recently when some friends asked me to join them on the Auckland Harbour Bridge. 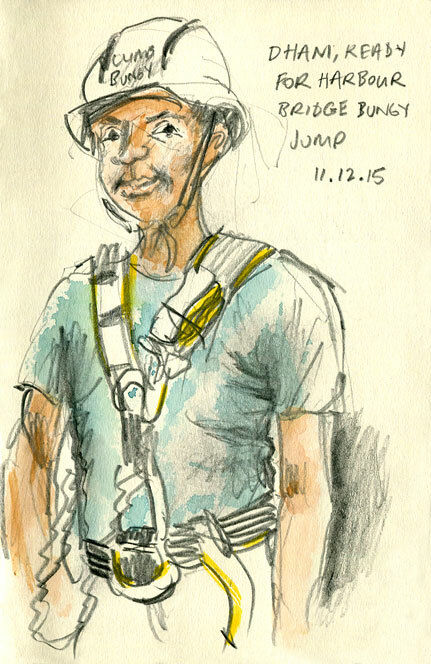 Dhani had been married the day before and the idea was to surprise him with a compulsory bungy jump. The walk is a lot of fun, you see the workings of the bridge up close, and eventually climb up to a specially designed pod attached under the highest part of the bridge. The pod is constructed of tubular pipes and stretched aluminium panels so looks more like the fuselage of a Catalina flying boat than some adrenalin junkies jump off point. Once on board you're surrounded by bungy cords, carabiners, ropes, tv monitors, emergency paraphernalia, spotlights, speakers, a sub woofer while cameras catch you at your most vulnerable. All that's left is a couple of gung-ho adventure operators with faux tribal tattoos. A switch is then flicked and the whole side of the place opens out so jumpers can see first hand what terrifying heights they're about to jump from. On the day Dhani was more than happy to make the jump, grinning ear to ear and diving off head first to take out top points for style. Nope. I would NOT jump.Well, not sober! I'm with you on that Dinah!